Of course we have to agree with Dianne Mechanique when she points to the "many more exciting and interesting things that happened entirely outside of the legislature." But the task of reviewing RA meetings is all that Danton can handle for the time being. Our previous instalment went up to the end of the RA meeting of 1 March 2009. Following the discussion of the General Master Plan, the next agenda item should have been Sonja Strom's proposal for a referendum process, but that was postponed to the following meeting. The meeting of 15 March 2009 opened among multiple crashes. LRA Symo Kurka then invited Sonja Strom to defend her bill for referendums. Sonja thought citizens should have the ability to vote on major decisions about the direction the community would take. The CDS Forum does have a poll feature, but not all citizens read the forum discussions. There followed much discussion as to how many questions could be asked per referenda, how many referenda could be held per term, or whether they would coincide with RA elections. No one contested the principle that the referenda would be merely advisory. The motion finally proposed one referendum per term, with up to five questions, to be voted along with RA ballot – and was passed. During the referendum discussion, since he had to leave, Symo announced that he was resigning from both the Simplicity Party and the RA. He stated: "I made this choice for personal reasons so please do not ask why." Discussion about his resignation followed after the vote on Sonja's bill. The person in Simplicity Party having received the next highest number of votes in the previous election would become the new LRA, and the Simplicity Party would name a new RA member to replace Symo. 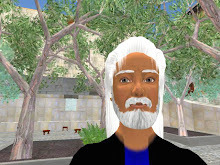 Arria asked for a report about the General Master Plan work group (formed by Cindy Ecksol and Gwyneth Llewelyn), stating that she would like to be involved in the process in order to integrate her pending proposal for the Monastery sim. Cindy replied that the work group was only reviewing the GMP process, and not the contents of the GMP. She suggested that Moon Adamant should report on the New Guild's development of the GMP content. Moon said that she was primarily sketching the basis for discussion of the technical aspects: cluster themes, orography, densities and transportation. Arria reiterated that she wanted to participate in the collection of that data. Cindy jumped back into the discussion to emphasize that the political aspects were creating problems, since no one in either the RA or the executive was responsible for moving the GMP along. Solomon Mosely asked if the Guild was currently reviewing the GMP for regular maintenance or for a specific proposed expansion. The answers that came back from various sides were contradictory, but generally indicated that both purposes were being pursued separately. The meeting was adjourned. There followed a discussion of upcoming RA meeting times and frequencies. Then under "prior matters" Cindy brought up the outstanding flag and anthem proposals. To get discussion started she made a motion to adopt the Flag Bill. The main point of dispute was the number of stars, and whether the number would be fixed (at three or four) or changeable (such as to reflect the number of sims, for example). The final amended bill specified four stars, one for each branch of government plus another representing the people, and was passed. Gwyneth Llewelyn moved to adopt the proposed anthem, which was made up of two parts: lyrics and music. A recording was played in-world. The motion carried, and the meeting was adjourned. The first substantial topic at this meeting was Pip Torok's suggestion concerning the "Look and Feel" within CDS sims. Pip proposed that when changes are going to be made to public lands (not private lands), the doer should put an announcement in a permanent "Look and Feel" thread on the forum a week before, stating what is to be changed (for example, choice of music or silence, advertisements) and the length of the change (indeterminate or with finish date), letting any opposed citizen express their objection to such a change. Cindy spoke against the motion because CDS already had caretakers to whom responsibility for such changes had been delegated (those planning such changes should ask the sim caretaker for prior approval). Brian agreed that this responsibility seemed to be in the realm of the executive. Rose Springvale also felt that the caretakers in CDS were responsive and dedicated, and should be trusted to approve changes without having to give public notice beforehand. Pip replied that the list of caretakers should at least be published so that citizens could know who they are. Brian linked to the list of caretakers on the Executive page of the CDS portal. Pip finally withdrew his motion. Then came "Citizen items." Rose Springvale had mentioned earlier that the Chancellor had opened the events budget for sim-specific events to be presented by residents of the sim, and that all citizens were invited to join the events team. She added that she wanted help with organizing the anniversary of CDS. She also said she would like to see more shops on the marktplatz and less offices for factions. Finally, she requested that potential citizens be sent to her, since CDS had a lot of land to sell. On another subject, Arria Perrault requested that in future the RA agenda should be clearer, without items listed just as "TBA" (to be announced). The meeting was adjourned. This meeting was attended by a guest, Sigmund Leominster, writer for Prim Perfect Magazine which was highlighting CDS as sim of the month. First item discussed was the proposal concerning the possible merger of Al Andalus and CDS, as posted on the forum by Chancellor Jamie Palisades. The proposal was not yet up for vote, and what Jamie presented was more a list of bullet points than a legislative bill. Jamie noted that the two main AA sims were well occupied and broke even, although since AA operated as a nonprofit it got reduced sim costs from Linden Lab (about half the standard rate). This different in costs and status (the estate owner must be affiliated with a nonprofit, which Sudane cannot do) might be problematic. In the long term it might be possible to create a shell nonprofit for all of CDS. Moon Adamant and Gwyneth Llewelyn were worried that Jamie was suggesting that all of CDS would go under the umbrella of AA's nonprofit. Moreover, Gwyneth indicated that she would prefer as a goal to have harmonized rates. Jamie presented data about the rates in each of the CDS and AA sims, observing that CDS did not itself have harmonized rates. The AA rates were seen to be around the level of the low end of CDS rates. Arria Perrault asked whether, in the case of a nonprofit, the estate owner was the real-life organisation or an individual. Jamie replied that it was the individual (their avatar). Since Rose Springvale was the current non-profit estate owner, one possibility would be that she retain that role, but as an officer of the CDS government. Or, Gwyneth suggested, Rose could become owner of CDS as well, as a short-term solution while a longer-term solution is being sought – or alternatively Sudane could own all of both AA and CDS. Rose thought changes of ownership would cause needless costs. Jamie continued his presentation by observing that AA had four "homestead" void sims, each with a break-even tenant. These could serve as transition sims when joining AA to CDS – the tenants were all willing work with CDS on the necessary terraforming. Moreover, AA wanted CDS to take on these sims as a condition to the deal. As to politics, it appeared that AA folks were comfortable with bringing AA into the current RA and citizen structure. Then Moon Adamant reported on the workgroup that had been formed to review the General Master Plan. She said that the group process of considering the future AA location with respect to CDS had been rough. Jamie suggested that the Guild should take the available data and, within 30 days, suggest at least two possible positions for the AA sims. On Moon's suggestion, Rose accepted the role of officially representing AA in the GMP workgroup. LRA Soro Dagostino noted that there seemed to be consensus to move this question to the GMP workgroup. The next item was Arria Perrault's latest proposal concerning a new homestead sim to house the Monastery. (Arria's struggle to get CDS to approve this sim was the main issue within the RA during the entire Fall 2008 term.) Arria's latest proposal took the form of a letter to the Chancellor, which Jamie posted into the RA chat log. Arria confirmed that she was ready to pay the fees on the Monastery, as well as on the 6 other plots within the homestead for 4 months following the opening of the new sim, if they found no owners within that time. Jamie suggested that CDS accept Arria's proposal, which would mean that CDS would buy the homestead sim, that Virtus (Arria's nonprofit) would do the terraforming and amenities of the sim, and that CDS would carry one month of tier without tenant rent. Rose noted that the problem with homestead sims is that they have only 1/4 the prims of a regular sim, and a 20 avatar limit, which makes it difficult to hold even minor events on them. She was of the opinion that CDS would be better served by placing the Monastery on a full sim. Arria replied that Monastery organizes few events, and that the rates were based on CDS average price-per-prim. Soro closed the discussion by observing that Jamie had suggested referring this question to Guild for review at the same time as the AA proposal, to which everyone acquiesced. Rose announced the upcoming opening of the To Limani Greek project in Locus Amoenus, and the Queens Day celebration on April 30 in Alpine Meadows (initiated by Naftali Torok in honour of the Queen of her native Netherlands). She also announced that the last day of the Al Andalus Feria was getting under way.